The civil society organisations on Saturday said the 10-hour statewide bandh in Nagaland from 6 am to 4 pm on Monday will be imposed as scheduled. 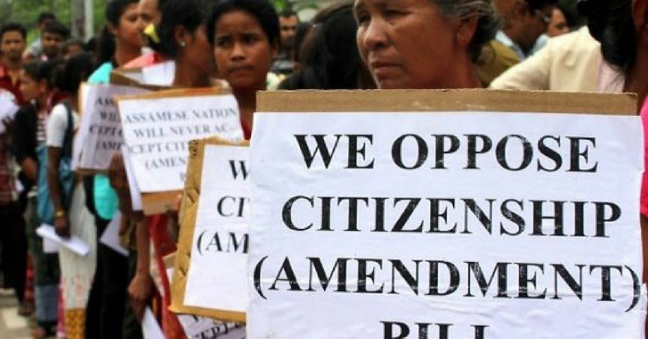 The coordination committee of tribe hohos, civil society organisations, various committees and mass-based organisations under the aegis of Nagaland Gaon Burhas Federation (NGBF), in a release, said the strike has been called to protest the planned passage of Citizenship (Amendment) Bill, 2016, in Rajya Sabha. The federation termed the move of the Centre to make the Bill a law as “unconstitutional” and “against the sentiment” of the people of the Northeast. The Naga People’s Front (NPF) on Saturday also extended support to the strike call. NPF president Shürhozelie Liezietsu directed all party leaders and the divisional presidents to cooperate and actively participate in the strike in their respective places to send a clear message to the NDA government in New Delhi that the Naga people are totality opposed to the Bill. The NPF also lambasted BJP general secretary Ram Madhav’s statement that the NDA government will place the Citizenship Bill in Rajya Sabha for approval in the ongoing session as a supplementary at a time when the whole of Northeast region is making a hue and cry to scrap the bill once and for all. He NPF also reminded that its Rajya Sabha MP K.G. Kenye will vote against the bill if it is placed in the house. The party also asked the Naga public not to succumb to any pressure but to be united in one voice and fight against the bill to protect the indigenous people of the state as well as the northeastern region. The coordination committee said the strike has also been called to attract the attention of the Centre towards the seven-decades-old Naga issue. It appealed to “all-right thinking” Nagas to observe the bandh whole-heartedly and peacefully and all tribe hohos to take responsibility of their own districts. It said respective tribe hohos are free to implement their own modalities in ensuring the bandh in their respective areas. Claiming that the Citizenship Bill would strike at the very heart of indigenous people’s existence, the committee said it was imperative that all concerned Nagas should welcome the bandh to show “our deep resentment” to the central government that “our right to existence cannot be toyed with”. The committee said the message of the bandh to the Central government and successful expression of solidarity to “our north eastern brethren” lies with the respective tribe hohos of 11 districts and two sub-divisions of Tseminyu and Meluri. It requested Naga Council, Dimapur, along with its 19 federating tribal units, to enforce the bandh in Dimapur district. The committee further urged the Naga people to respond to the call of Nagaland Joint Christian Forum for prayer and fasting on Sunday for resolution of the Naga political issue.